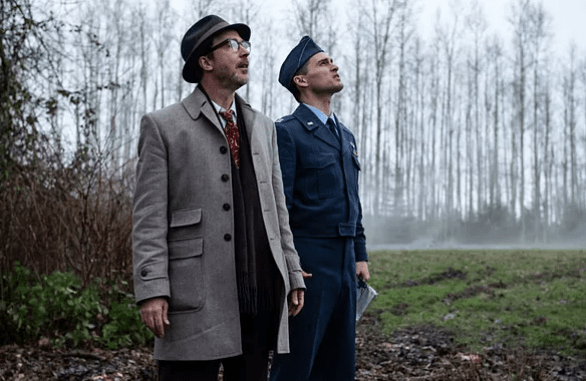 History Channel's 'Project Blue Book' scrapes the bottom of the barrel for 'War Games' – AiPT! Maybe the worst-documented encounter the show has presented. Amid its fanciful, unabashedly fictional plot, History Channel’s Project Blue Book series continues to pepper in “classic” UFO reports from throughout the Air Force program. Some, like the infamous scoutmaster encounter, were actually investigated by Blue Book, while others, like the Flatwoods Monster, were not. The case featured in this past week’s episode, “War Games,” occurred during the Korean War, and very little information on it exists. Francis P. Wall was a private in the U.S. Army, deployed during the conflict. In just about the only account of the incident you’ll find, Wall told John Timmerman of the J. Allen Hynek Center for UFO Studies in 1987 that one night in the spring of 1951, his company saw what looked like a “jack-o-lantern” descend from a nearby mountain to where airbursts were ongoing, over a village. The object was seemingly unaffected by the artillery, despite its proximity. Wall only reported one object, and only he fired on it. Then it turned a “blue-green” color and approached the Americans, with Wall firing at it and hearing his bullets ricochet off. The attack made the light go berserk, flashing on and off and producing sounds like a “diesel locomotive” before finally retaliating and emitting a “ray” that induced a “burning, tingling sensation” in Wall and the other soldiers. After the men took cover, the object shot away at high speed. Wall claimed the entire company became struck with dysentery and had to be evacuated three days later, with later tests showing the men had extremely elevated white blood cell counts. I say “Wall claimed” because no report was ever filed, and despite the headline of a History Channel article published last year, no one in Wall’s company ever came forward to corroborate his story. The writer, to her credit, does admit that even if Wall experienced the symptoms he said he did, bacterial infections with the same effects are not uncommon during wartime. The article states that Wall suffered health effects after the war and struggled to make ends meet, a story that’s also sadly too prevalent among military veterans. Until now, Project Blue Book has at least done a good job of presenting cases with plenty of documentation, for or against an unknown origin. Why the creators chose to spotlight a report from a single person made 35 years late with no back-up from what should have been dozens of other witnesses is a mystery unto itself.